Mount Welirang and Arjuna Trekking Package 4 Days is special climbing package for visitors who have a hobby in volcano climbing. Welirang and Arjuna trekking tour package have similar duration with Semeru trekking package 4 days 2 nights camping. the different only in trekking route that started from Tretes village. Arjuna, Wlirang Climbing Package have a great challenge than Semeru Climbing Package. because the visitors will spend their time in 2 high volcano. To enjoy Wlirang Volcano and Arjuna climbing, You can start from Surabaya, Malang or Banyuwangi at 04.00 - 05.00 AM, If you can not start at early morning, You can stay 1 night first in the hotel around Tretes village. 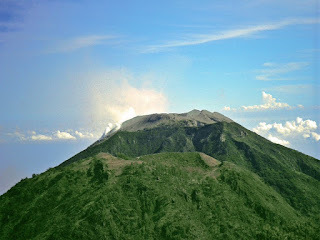 Welirang, Arjuna volcano trekking tour package will finish at 03.00 - 04.00 PM. Finish enjoy Arjuna, Wlirang Trekking, If You have more time, You can continue to Mt Bromo area to enjoy Mt Bromo Sunrise tour Or you just comback to Surabaya, Malang or Banyuwangi. Detail itinerary, You can read more below. Pick you Up by private AC (air conditioned) Car in Surabaya Airport, Malang, Banyuwangi Harbor or Bali, then continue to your hotel around Welirang or Arjuna area, exactly at Tretes village for 5 hours then stay 1 night while enjoy the circumstance. Wake you up for breakfast, take shower, Check Out and visit tretes village or Batu Village then climb to Welirang Arjuna volcano through Lembah Kijang base camp for 5 hours wherein the visitors usually make a rest before cotinue trekking to Welirang and Arjuno volcano, a base camp on the foot of Mt. Welirang (3,156 m). Passing through the locals farmland, meet the friendly local peoples doing work. Beside passing local farmland, we wil also passing a dense jungle where most deer and other kind of faunas living. Lembah Kijang is a main basecamp to Arjuna summit. Stay overnight on the camp gound. After breakfast, Starting for trekking to Kokopan / Lembah Kijang camp (base camp of Sulfur mining people), trekking will be take 5-7 hours. Stay Overnight here. At night, You will hear the deers voice loudly calling their mate. If we are lucky, we will also can see some of them. Before dawn, trekking to the summit of Welirang and Arjuna Volcano, Strat trekking to Wlirang summit normally 7 hours, Reach the rim, Enjoy Mt Wlirang Sunrise. Arrive back at the basecamp about 10.00. rest time after the 7 hrs of rough hiking. Anther the Arjuna Weliran summit attack today, but more interesting. From this basecamp, You will pass two small peaks / hills which named Puncak Kembar (twin summits) of Wlirang and Arjuno Volcano. Normally need 3 - 4 hours to reach the Arjuno summit, Enjoy Mt Arjuna Sunrise and view. Detail information about Welirang and Arjuna Volcano Trekking Package 4 Days 3 Nights, Mount Semeru hiking package, Mount Bromo tour package price, Accommodation and other facilities, You can visit Our Contact.